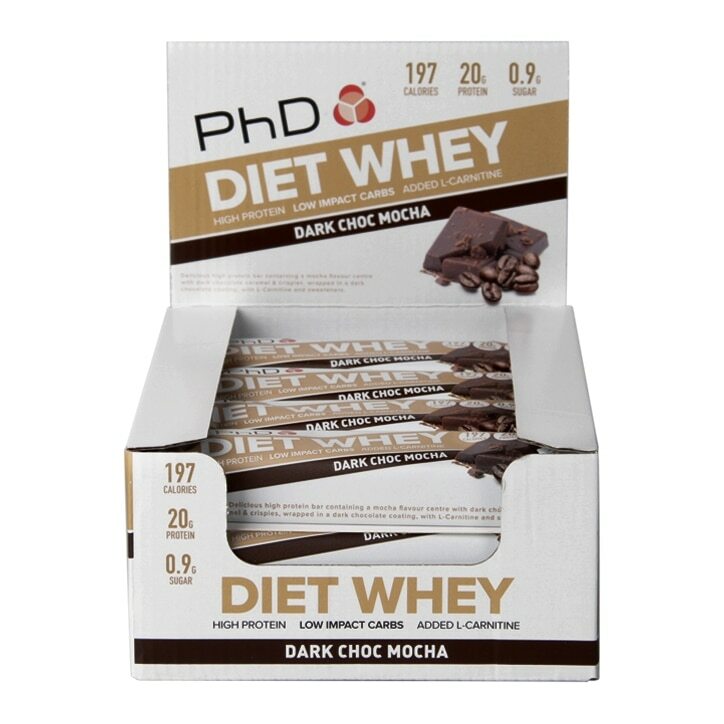 PhD Diet Whey Bar Dark Chocolate Mocha is rated 4.5 out of 5 by 8. Rated 1 out of 5 by Buffy1 from Diet whey chocolate mocha I bought this a fortnight ago because I love the companies chocolate mint and I love coffee. However, in my opinion this leaves a horrible after taste a nd I wiki not purchase again. Rated 5 out of 5 by emirizzi from Serious stuff!! I’m a massive fan of these. Love the coffee, love the dark chocolate; All round AWESOME bar. Rated 5 out of 5 by V_880 from Wow I like Mocha and I like chocolate, so the fact this bar combines this while offering me 20g of protein is a dream! Rated 5 out of 5 by Jacko 123 from Amazing Protein Bars These are the best tasting bars on the market! I would recommend them to anyone looking for a low sugar / high protein bar.